Vietnam doesn’t have skiing. That fact makes it an unlikely candidate for the title of world ropeway capital. With multiple record-breaking gondolas operating and more under construction, that may soon change. In 2007, Poma built a spectacular installation over two miles of ocean called the Vinpearl Cable Car. The Hanoi-based Sun Group is behind many of Vietnam’s lift projects and is perhaps the Doppelmayr/Garaventa Group’s best customer. Sun Group operates the second longest mono-cable gondola, just commissioned the world’s longest 3S gondola and is currently building another 3S that’s a mile longer than the first one. Now they are building a huge aerial tramway and at least two more gondola lifts. A big tramway for a big wheel. 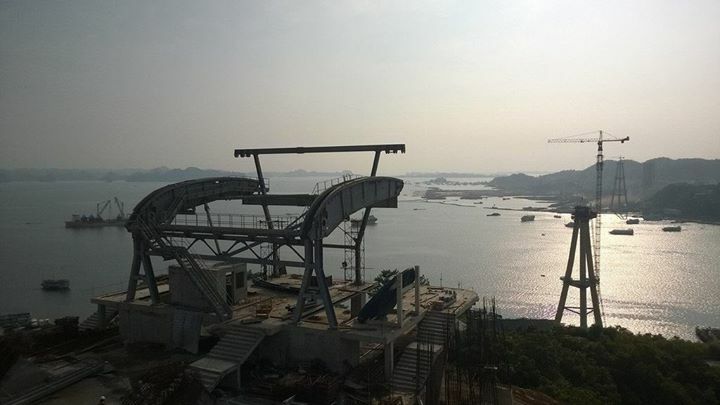 Vietnam’s first reversible aerial tramway under construction in Ha Long Bay will break two world records. 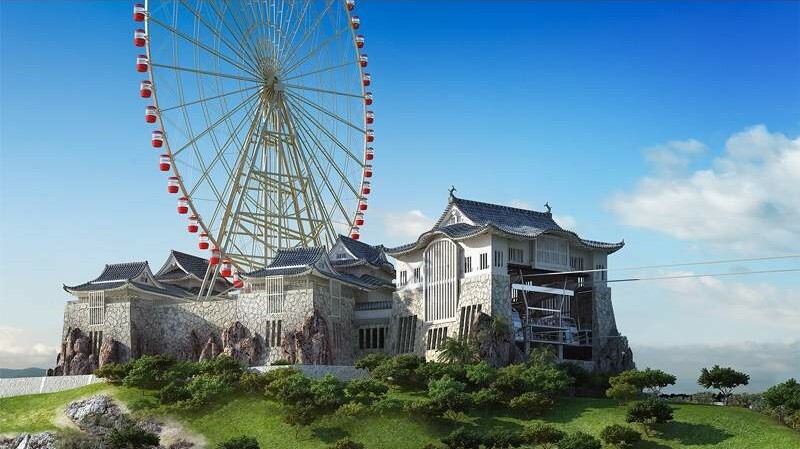 The Mystic Mountain Skyway Ha Long Queen Cable Car will link a new amusement park called Ha Long Ocean Park with one of the world’s largest observation wheels on a neighboring mountain across the bay. The $282 million project is a perfect site for an aerial tramway with two points needing to be connected but with natural obstacles in between. At the same time, the alignment is relatively short with moderate capacity needs. After several high-profile incidents, a good reminder from the NSAA that 86 percent of falls from chairlifts can be attributed to rider error. Lots of questions surround last week’s skier-pushes-snowboarder-off-lift story from Aspen Highlands. Police say even without an arrest made, the public is not in any danger. Bravo to Bristol Mountain for actually pressing charges against a freeloading teen for theft of services. Only at a tiny mountain in Maine would volunteer ski patrollers derail a double chair they are also responsible for inspecting. An Austrian man is in a coma after the harness he was wearing around his neck became entangled with a platter lift carrier. At least one lift operator may not have been at his or her assigned post. Mt. Rose Ski Tahoe is for sale. Dignitaries break ground at Laurel Mountain in preparation for a November re-opening. The Balsams Wilderness won’t re-open in 2016 after all. A revised timeline has three new and two existing lifts spinning in late 2017. This is our 200th post! I always find this time of year exciting as ski resorts announce new lifts projects, many of which catch me by surprise. This week we learned Le Relais Ski Centre, located just outside Quebec City, will replace three lifts with a Doppelmayr six-pack capable of moving a huge 3,600 skiers an hour. Two T-bars (a 1960s Mueller and 1987 Doppelmayr) as well as a fixed-grip quad (1987 Doppelmayr) will be removed. A project like this would normally re-use existing towers tubes, but Le Relais has some crazy offset towers that support both their quad chair and 1987 T-Bar. Thus the six-pack will get brand new towers in addition to 60 six-passenger chairs. Slope length will be just under 3,000 feet with a vertical rise of 676′. The ride will take just three minutes at 5.1 m/s. A Chairkit loading carpet is included in the $5+ million lift, which will be built at Doppelmayr’s plant just down the road in St. Jerome. Congratulations to Le Relais Ski Centre and the Beaulieu family on what’s sure to be a huge hit with guests. Lifts B, C and D will be removed. Next season, Le Relais will operate two modern high-speed chairlifts and two platters. The MND Group announced yesterday it will begin selling detachable chairlifts and gondolas from 2016 through its LST Ropeways subsidiary, becoming the first new entrant to the detachable lift market since CTEC in 1990. Based in France, LST has built more than 550 lifts to date including a handful of detachable chairlifts utilizing grips from the defunct German company Wopfner. Yesterday’s announcement outlines LST’s all-new detachable product for both mountain and urban applications. The combined market, estimated by MND at $865 million over the next 25 years, has been a duopoly since Leitner and Poma joined in 2002. Hence new competition is big news. LST has spent more than $2.7 million to develop detachable technology that doesn’t require licensing from others. 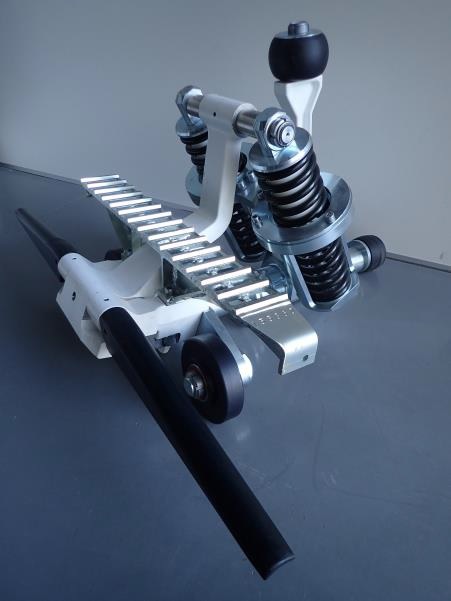 The most important component of any detachable lift is the grip; LST chose a double-position grip that opens and closes only once at each terminal, reducing the number of cycles by half compared with a single-position grip (keep in mind a grip that stays open through terminals presents its own challenges.) LST says its patented grip requires less force to open and close than competing models, reducing wear while allowing speeds of up to 6 m/s (1,181 ft/min) and requiring 15 percent less energy. LST detachable terminals will be 70 feet long with 75 percent fewer tires compared with competing terminals. While LST says its stations will be shorter than its competitors’, I believe the shortest LPA terminal is ~67 feet. LST’s all-new carriers (both chairs and gondolas) “designed for comfort and safety” are forthcoming. Luckily Manning Park Resort was in on letting pro mountain bikers pretend to break into and operate one of their lifts. When chairs can’t spin because there’s no one to staff them. BMF opens its sightseeing aerial tramway in Puebla. Its 35-passenger cabins were manufactured in Austria by Carvatech. 12 year-old boy falls out of a chair at Wachusett, avoids serious injury. Snowboarder accuses skier of shoving him off Aspen Highlands’ Loge Peak lift mid-ride in a story that goes viral. Just one day later, the Pitkin County Sheriff’s Office thinks they’ve identified a suspect. Doppelmayr is building an 8-passenger gondola this spring at the Oakland Zoo to serve a $62 million expansion called California Trail. The lift will have 7 towers, 15 cabins and open in late 2017. The zoo will continue to operate its Safari Sky Ride triple chair that was built by SkyTrans. DCC (Doppelmayr Cable Car) wins a $24 million contract to build its 10th cable-propelled automated people mover in underground tunnels at Moscow’s Sheremetyevo Airport. Today, Vail Resorts announced its acquisition of Wilmot Mountain near Chicago, adding to the company’s portfolio of regional resorts in the Midwest. 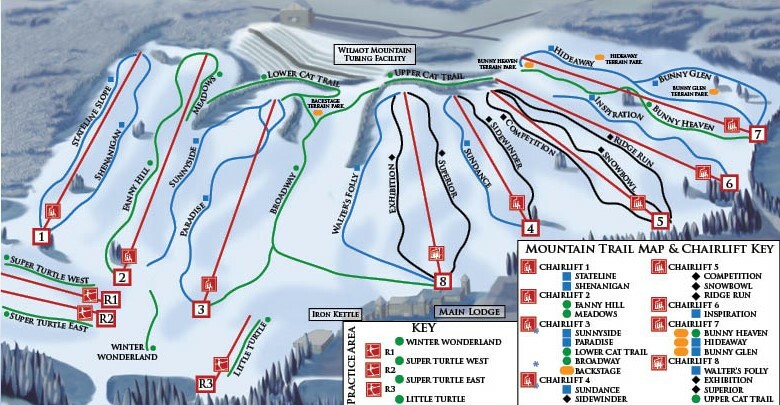 Vail bought Mt. Brighton near Detroit and Afton Alps near Minnesota’s Twin Cities back in 2012. The addition of Wilmot brings Vail up to twelve resorts in Colorado, California, Michigan, Nevada, Utah and Australia. The company will announce specific improvements in March, but today’s release mentions bringing state-of-the-art lifts to Wilmot Mountain. The ski area currently operates eight chairlifts – four doubles, three triples and a quad – built by Riblet, Hall and Borvig in the 1960s and 70s. This is Vail Resorts’ fifth new ski area in three years and it will be interesting to see where they go next. The sign went up this week at Jackson Hole, which will become the 12th mountain in the United States with the distinction of having two gondolas. 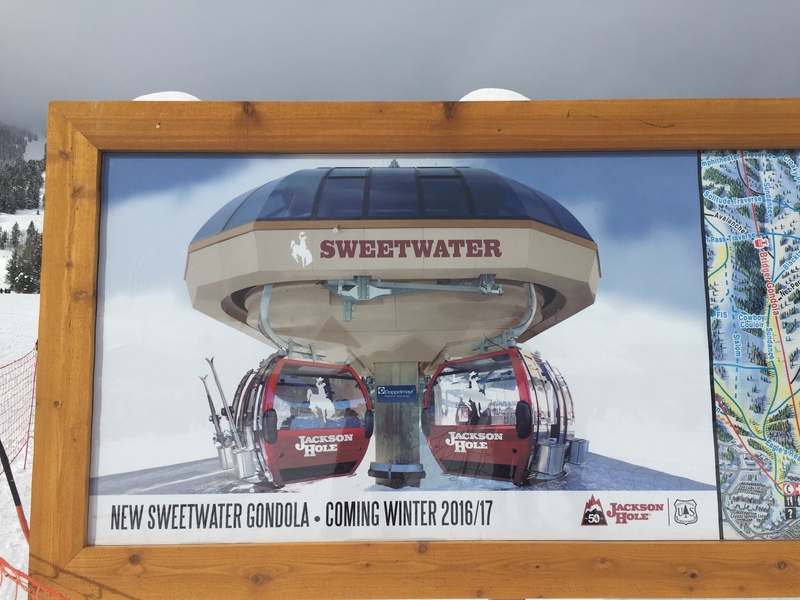 The new Sweetwater Gondola will replace the Eagle’s Rest and Sweetwater chairs in two stages. Built by Doppelmayr, it will boost out-of-base capacity by 25% and provide direct access to beginner and intermediate terrain at mid-mountain. In the future, a dedicated learning facility with dining, lessons and rentals will open at the mid-station just north of Sweetwater’s existing bottom station. Though expensive, gondolas have proven to be extremely efficient and less intimidating than chairlifts for people learning to ski and snowboard. It looks like Doppelmayr will modify its Uni-G terminal skin in an effort to match the Poma terminals next door at Teewinot and Bridger. This section of Rendezvous Mountain has an interesting lift history. 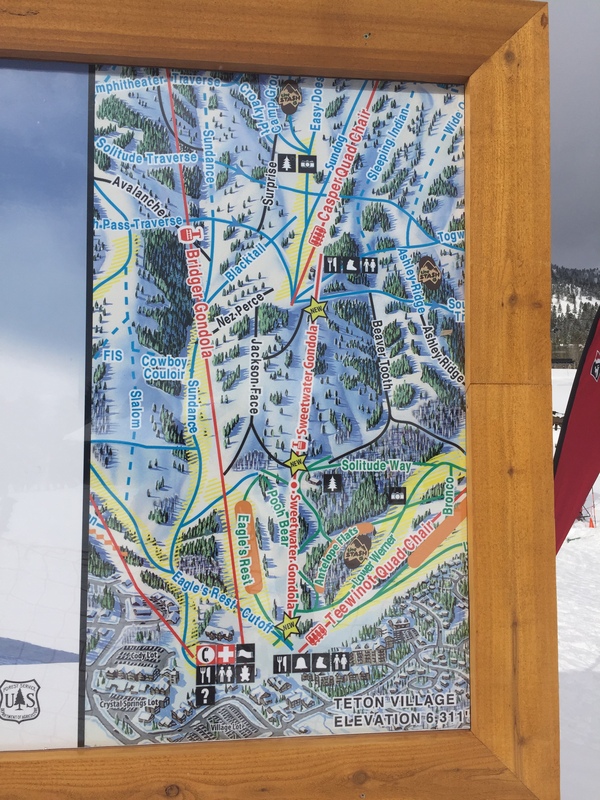 A Riblet double chair named Crystal Springs served a similar alignment but with no mid-station from 1978 until 1997, when it was removed to make way for the Bridger Center and Bridger Gondola. If you ride Eagle’s Rest today, there is still one Riblet tower where the old Crystal Springs crossed under on its way up. Eagle’s Rest is one of three original lifts opened at Jackson Hole in 1965, even before the first tram. When Eagle’s Rest is retired this spring there will be just six Murray-Latta lifts remaining in service worldwide. The new gondola also replaces Sweetwater, a triple chair that found its way to Jackson in 2005 by way of Winter Park. It was the Zephyr triple from 1983 to 1990 and Eskimo from 1990 to 1999 before sitting in storage for six years. Built by Lift Engineering, it was upgraded over time with Poma chairs/line gear and Doppelmayr CTEC controls. Assuming it gets re-installed somewhere, the equipment will be in its fourth home! Sweetwater’s two sections will have around 8 towers each. Snowbasin will test solar-powered USB charging bars in five of its gondola cabins in partnership with Goal Zero. Mt. Waterman in Los Angeles’ San Gabriel Mountains reopens this weekend with 3 Riblet doubles operating for the first time in five years. The mountain will honor all tickets and passes sold since 2011! Two years after his 6-year old daughter fell from a chair, a New Jersey man sues Campgaw Mountain and the town/county it’s located in for “careless and reckless” operation of a ski lift. Sugarloaf just can’t catch a break. A power failure shut down most of its lifts for hours on their first Saturday with snow. Did you know Doppelmayr operates a zoo with more than 400 animals at its headquarters in Wolfurt? Somebody had to do it. Spirit Mountain, Minnesota becomes the first to offer lift-served, downhill fat biking starting Sunday. Whistler Village Gondola cabin #84 returns to its roots in the Alps as The Coffee Gondola. What appears to be a Doppelmayr quad chair rolls back in China, screaming ensues.